Teeth Whitening – Yandina Dental. The most common reasons for teeth to become yellow or stained are using tobacco, drinking dark-coloured liquids (tea, coffee, cola, red wine etc) and not taking good care of your teeth. As you get older, the enamel on the teeth thins and the yellow dentine underneath gets darker, making the teeth less bright. Before proceeding with teeth whitening, it is important that you first see your dentist for a checkup and hygiene clean. Cleaning will remove the film of bacteria, food and other substances from the teeth so the whitening solution is able to penetrate through for an excellent result. We offer two options for teeth whitening: in-office or take-home kits. For in-office whitening, your dentist will apply a substance that covers and protects the gums around the teeth, then the whitening agent is placed on the teeth. This treatment usually takes 1.5 hours. For optimal results your dentist may suggest that you continue the bleaching process at home for a few days or weeks with some spare tubes of bleach issued at the first appointment. For take-home whitening, your dentist can make flexible trays that fit your teeth precisely to hold the whitening gel. This usually needs to be applied daily for 1-2 weeks for optimum results. Please be aware of whitening products that you can buy over-the-counter or businesses who offer it with no knowledge of dentistry. They use a weaker whitening agent than the products you can get from your dentist. Therefore, whitening may take longer and it is less safe when administered by someone with no training in dentistry. It is always a case of “you get what you pay for”. Whitening toothpastes are to be used sparingly as well. They contain abrasives that remove stains on the enamel, but can also make your teeth more sensitive and yellow by thinning the white enamel and allowing the yellow dentine underneath to show through more. 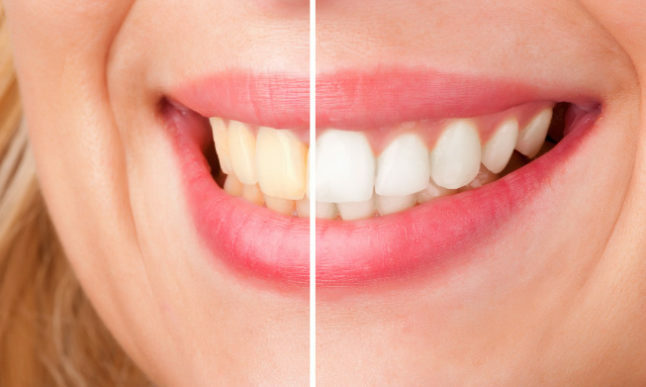 At Yandina Dental we also offer non-vital whitening, also known as internal bleaching. This is useful for teeth that have turned grey from root canal therapy. A whitening agent is placed inside the tooth and a temporary filling is placed over the top. This may be redone over several visits until the best result is obtained.